When you’re an excessively small person, heavy gusts of wind can pose a serious threat to your safety. 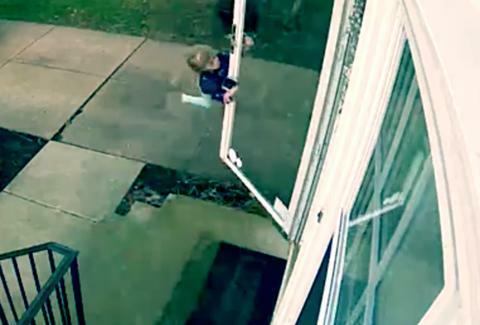 Four-year-old Madison Gardner discovered this the hard way earlier this week, when a windstorm in her town of Lyndhurst, Ohio literally carried her away as she opened the door to her family’s home. Gardner’s parents were clever enough to set the footage to Frank Sinatra’s “Come Fly With Me,” a song that’s probably never been more appropriate. Madison’s mom, Brittany Gardner, told a local Fox affiliate: "She is totally OK...She was scared at first, then was laughing away at it. She held on until I took her off the handle." Here’s to you Madison, and your dogged determination to hold on, even in the face of extreme difficulty.